It’s been a while since I last twitched anything of note but weekend before last a certain North American visitor piqued my interest sufficiently to spur us into action. I am of course speaking of the long staying drake American Wigeon which rocked up at the Gann in Pembrokeshire earlier this year. Since then it’s been showing well and, contrary to the ideals being promoted by its country of origin, has been welcomed with open arms. 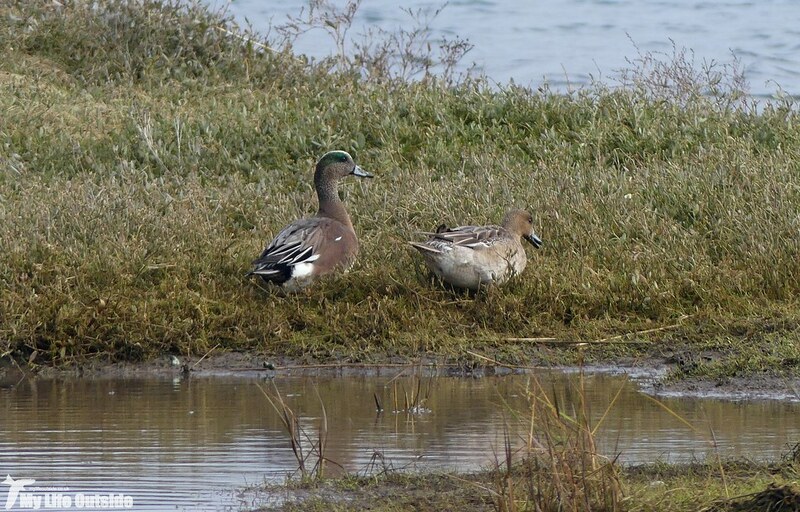 He even seems to have teamed up with a female Eurasian Wigeon in recent weeks. Whatever would Trump say! That’s about as political as I’ll be getting tonight so instead let’s travel to Dale early on a mild and foggy Saturday morning. 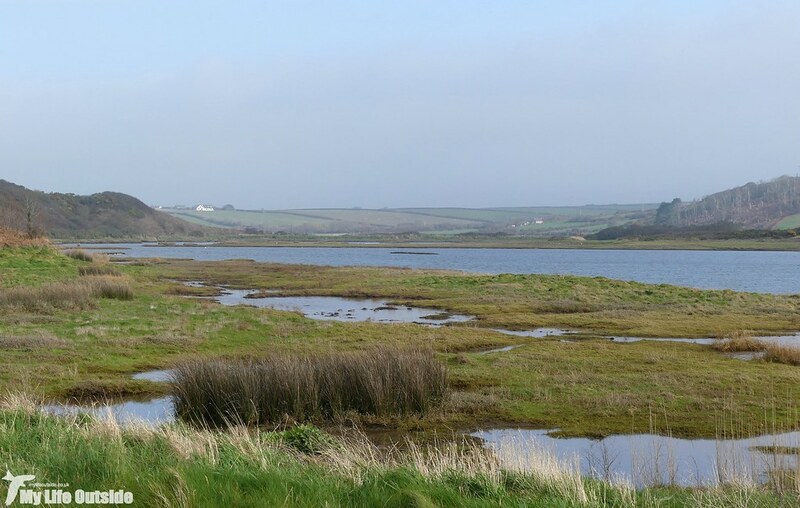 Conditions had been steadily worsening as we headed west and despite telling myself it would be clearer at the coast, one glance across the Gann estuary told a very different story. Sea and sky seemed to meld into a single contiguous mass of grey but as we pulled into the car park a small flock of Wigeon on the nearest lagoon seemed as promising a place to start as any. A couple of minutes later and, armed with binoculars, we were soon enjoying the sight of an American Wigeon going about its business, followed throughout by his newly acquired female companion. Both were actively feeding near a group of roosting Oystercatchers and were more than happy to pose for a few photos which, even given the relatively close distance between us, ended up being pretty poor. But wait. By some miracle the sun chose that moment to break through the murk delivering strong sunshine and clearing skies. This was more like it and with the birds still happily feeding away I was finally able to capture some respectable images. Of course you’re never quite close enough but hopefully the above shows just what a cracker this bird is. If I was to describe it as a Wigeon with added highlighting I wouldn’t be far off the mark and that green eye stripe, white crown combination really stand out in the field. Having our own native species in close proximity was just a bonus given that I wasn’t expecting to get views anywhere near as good as these. Talk about lucking in. Our good fortune was further emphasised a short while later as, having taken their fill, both birds took to the water and swam off towards the river. From this point on they were much harder to keep tabs on, often distant and sometimes absent all together, lost on the myriad of saltwater lagoons that make this place such a good spot for waterfowl. We only stuck around for an hour or so but in that time managed to also record Brent Geese, Redshank, Teal, Goldeneye, Little Grebe, Shelduck, Little Egret, Knot and Ringed Plover, not to mention a hugely impressive flock of some hundred plus Curlew in flight over the marshy land upriver. I can’t recall seeing Curlew in such numbers anywhere of late and they very nearly managed to upstage our American guest. Nearly, but not quite.